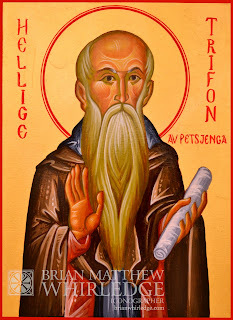 I recently completed this icon of Saint Tryphon of Pechenga. His name is in Norwegian, as this icon is currently headed to Oslo. Saint Tryphon was a 16th century Russian monk, who from his early years resolved to devote his life to apostolic deeds and to proclaim to the Sámi people (Lapps) the Gospel of Christ. Sápmi (Lapland) is in northern Scandinavia, largely within the Arctic Circle, and stretches across Norway, Sweden, Finland, and Russia. The holy preacher suffered much hardship, enduring hostility and beatings. But gradually, through his wise and kindly words and meekness, many in the region were converted to Christ.